George Herbig passed away peacefully yesterday at home in Honolulu. He was 93. George was my grand adviser, of a sort. When Geoff Marcy was earning his PhD at Santa Cruz Steve Vogt was his formal adviser, and George worked closely with him, teaching him spectroscopy and his philosophy of observational astronomy. Most students will encounter George’s name when they learn about Herbig-Haro objects. 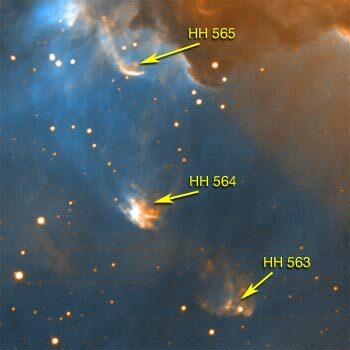 These “objects” are the bow shocks formed when a bipolar outflow from a forming star forms a jet of material that collides with the gas and dust in the interstellar medium. George determined that they were the products of star formation and elucidated their true nature. I met George Herbig exactly once, when he was about 85 years old. He was observing at Keck Observatory the night before I was on with Geoff Marcy, and I stopped by the control room in Waimea to say hi. I asked what he was observing, and he told me he didn’t know! Someone had found something strange, so he had gotten a night of HIRES time to see what it was. He was taking the first spectrum as we chatted. In retrospect, I think this was part of his campaign to study V1057 Cyg. As the first spectrum came up, he zoomed in on a line and took a cut. When the spectrum came up, I instantly recognized a P Cygni profile, and asked if that was it was. He said “apparently so!” In retrospect, he must not have been surprised to see it, but I think he was emphasizing his philosophy of being ready to be surprised, and not presupposing you know what a strange (and time variable!) object will look like next. The next night, I was going through the California Planet Survey HIRES checklist. HIRES has a set of “standard” configurations for typical observing modes, and sometimes other astronomers use these for something other than planet hunting (the nerve!). Our checklist makes you check off every “knob” that can be “turned” on the HIRES GUI and be sure it’s set properly, even though most of this is perfunctory — many of the settings are rarely changed except in rarely-used configurations, and some of the settings are pretty obscure or obsolete and are essentially never changed in any mode. So I was surprised when a rarely changed item on the list needed addressing before I could check it off. I was doubly surprised when a second rarely-addressed item needed me to move an element in the spectrograph back to its “CPS standard” value. Then there was a third one. George had tuned every-single–setting on HIRES to be exactly what he wanted it to be. I’m not sure how many astronomers there are that would have a preference for every setting on HIRES. Maybe just him and Steve Vogt (who built it!). George was as expert an observer that ever lived. George’s adviser at Berkeley was Harold Weaver. Harold celebrated his 90th birthday in 2007, and, last I saw of him in 2007 or 2008, was still going to work in his office at Berkeley on a daily basis. George received his Ph.D. from UC Berkeley in 1948. George took me observing at the 120-inch telescope every month for four years. He patiently taught me spectroscopy and he led me through many projects. Among them were studies of the binary nature of the central stars of planetary nebulae, the hydrogen emission-line variability of T Tauri stars (on the Crossley telescope), Zeeman measurements of Sun-like stars, and the binary frequency of T Tauri stars. For that last project, George urged me to make ever more precise radial velocity measurements of stars. I’m still working on it. Most of all, George taught me to work carefully, to double-check all measurements, and to draw physically meaningful interpretations that don’t stray too far from the data. George’s approach to research influenced all of my work. Last year, Dave Soderblom and I visited George, at 92, at his home. He asked about everyone at Santa Cruz and Lick Observatory. Then, he eagerly brought out three or four research papers he was still working on, encouraging us to solve enigmas he found in the spectra. When I left the institute, Dr. Herbig wrote me a glowing letter of reference (and I was but a lowly functionary and drone). Now I can say I have an important autograph and artifact from my friend, “George” that one day perhaps I in turn will provide to a prestigious museum or collection of some kind devoted to George Herbig. 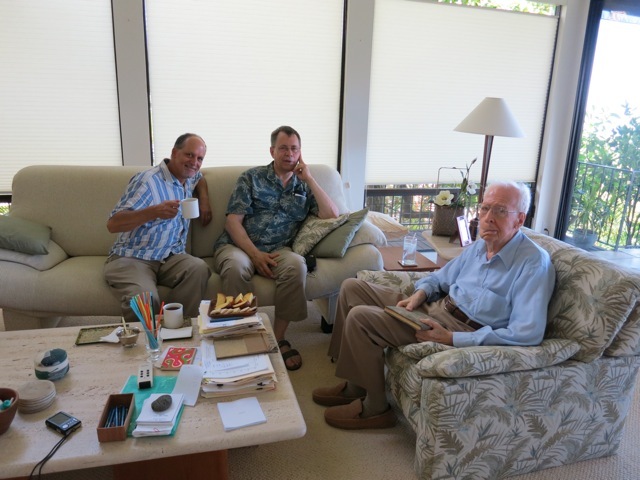 I’ve thought of George Herbig fondly and with a sense of genuine awe many, many times throughout the past few decades since I first met him in 1987 at the Institute for Astronomy in Manoa. Such a pleasure it was to come to know George Herbig, who may be the last true and distinguished gentleman in the world of astronomy. He spent every Christmas Eve and New Year’s Eve observing at the UH telescope. Once, in 1989 or 1990 or so, as he was addressing an envelope, he shared what he was about to send off — he handed me an equation that Edwin Hubble had written out in his own hand as they discussed a solution to a vexing problem some years prior. Herbig called him “Ed”.